One of the hottest games this year, which has topped the must-have Christmas toy lists – Lightseekers – has launched two additional heroes: Zyrus and Boulder. The new smart action figures join Jax and Kora, the Tyrax hero of the Tech Order and the Mari hero of the Storm Order respectively, to take on the Umbron menace in the beautiful world of Tantos. Dread hero Zyrus and Mountain hero Boulder have been designed by award-winning UK-based games developer PlayFusion and both feature the top quality build that the original toys are renowned for. Zyrus is a swift and deadly warrior who uses his intelligence and agility to dispatch his enemies. As a member of the Noxin, he is a confident and mysterious fighter who is not to be messed with. Meanwhile, the mighty Everok hero Boulder, of the Mountain Order, is unstoppable in battle, crushing his enemies with unmatched strength and bravery. PlayFusion has received numerous awards including being named Best Technical Innovation by TIGA, Toyology’s Toy of the Year, as well as Finalist for the US Toy Industry Association’s Innovative Toy of the Year. Judges have praised PlayFusion's proprietary technology platform that applies breakthrough artificial intelligence and robotics technologies to enable immersive mixed-reality experiences. 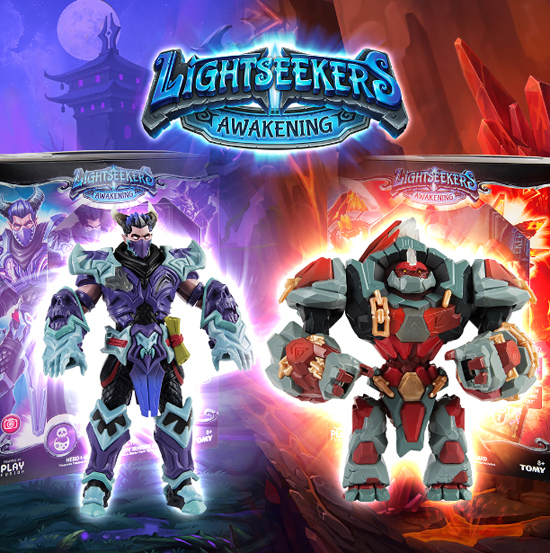 Mark Gerhard, CEO and Co-Founder of PlayFusion, said: “Lightseekers Awakening is a critically-acclaimed action adventure role-playing game (RPG) and is far more than just a game. It’s the fusion of fantasy and reality powered by our proprietary technology platform. Lightseekers smart action figures, trading cards and accessories are now available from Tesco online, Amazon.co.uk, as well as Toys“R”Us stores. The game, a story-rich action adventure RPG, is available to download for free on the Apple Appstore, Google Play, and Amazon App Store. The FusionCore, the high-tech, powerful mini-computer embedded within each action figure and the “brains” behind the smart connected toys, completely eliminates the need for cumbersome NFC portals, delivering real time two-way interaction between all of the 7” articulated smart action figures and the Lightseekers game. By adding a transferable FusionCore, which is sold separately to the new Hero packs, the characters can jump into the game. The price of the new hero pack, which includes a 7” smart action figure, batteries and augmented reality trading card, is £29.99.